A deer walks into a theatre…well, it doesn’t really walk..and it’s not really a deer… And the audience hears a car crash. Those who came from or have family from the Poconos area of Pennsylvania don’t have to question what has happened; Car accidents with deer are common, but…a deer decoy? We meet Joseph Douaihly, played by Kelsey Kurz, whose father was the victim of the high-school prank that went terribly wrong–and this is only another blow in a devastating year for the Douaihly family. Joseph has physical pain that the doctors cannot diagnose; he works for a lonely, manic woman that uses his need for health insurance as leverage to try to get Joseph to write a memoir based on his distant relation to Kahlil Gibran. When their father does not survive the accident, the Douaihly’s ailing uncle (played by Yusef Bulos) moves in with the Joseph and his brother Charles (played by Dan McCabe). In addition, the boy who pulled the prank might be allowed to play football in his school’s playoff games prior to going to the juvenile detention center for his crime. Hilarious, right? –You have no idea. 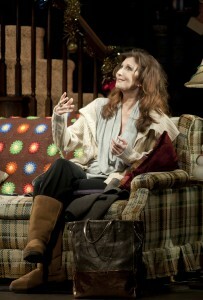 Joanna Gleason (Gloria) in the Huntington Theatre Company´s SONS OF THE PROPHET by Stephen Karam, directed by Peter DuBois. Playing 4/1/11-5/1/11 at the Calderwood Pavilion at the BCA. huntingtontheatre.org. Photo by Paul Marotta. The entire cast form a cohesive bond that makes the audience feel like they are a part of the action–even in the absurdity of the moments. Kelsey Kurtz plays Joseph, the central character of the play. His performance is believable and very human amidst all of the crazy events his character has to endure. The audience does not begrudge Joseph’s need to escape his house when everything has turned to chaos and he seeks comfort in the arms of the reporter Timothy (played by Charles Socarides). In fact, the audience has to stand slightly in awe of how much Joseph has put up with while largely neglecting his own needs. Kurtz’s explosions and moments of serenity leave the audience with hope that Joseph will survive and be able to handle life better as he continues to move through the struggles of his life. 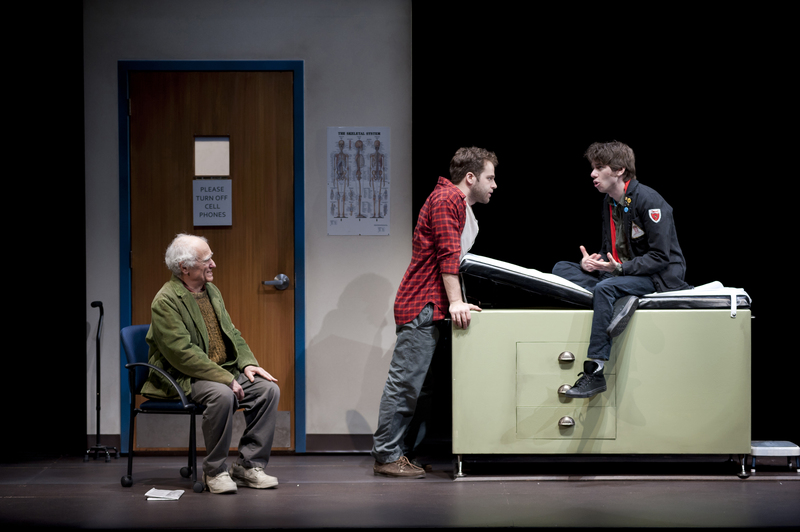 The character of Charles, played by Dan McCabe, is a high school student who is trying to make sense of the messed-up existence. Through that process, he finds what he thinks are messages from his father in a Mormon hymn and a verse of scripture in the Book of Mormon. Charles is gay like his brother; he becomes interested in Vin, the boy who pulled the prank and is both attracted to him and loyal to his family. McCabe’s sensitive and boyish persona make him the perfect choice to be both a seeker and teacher of the family. Yusef Bulos plays Joseph and Charles’ Uncle Bill. He is from the older generation–still racist, still out for justice instead of mercy; and yet, Bulos is loveable and crotchety in a way that demands family loyalty. Joanna Gleason plays the narcissistic, neurotic boss of Joseph, Gloria. Gleason brings her classic “down-to-earth” delivery to a highly unbalanced character. The combination results in a laughable, yet pitiable character. Gloria hangs onto Joseph not just for professional support, but also for personal support. Gleason’s performance emphasizes Gloria’s desperation to find connection as she tries to insinuate herself into Joseph’s family’s grief. Charle Socarides plays Timothy, Gloria’s estranged, closeted, gay son that is reporting on the car accident and the controversy that follows. He is working the story for a chance to get on a network news show. He looks for Joseph in an attempt to get a word from the family on the incident and finds himself attracted to Joseph. Socarides looks like a stereotypical, clean cut news reporter and acts as vacuous as any tv news reporter. Jonathan Louis Dent plays the somewhat clueless jock that commits the crime who is concerned about his chances to go to college if he does not play in the football game. Lizbeth Mackay and Dee Nelson provide the myriad of provincial characters that create the life and times of Lebanon, PA. They are especially sharp as the women running the school board meeting (it kind of gives me chills down my spine reminding me of elementary school). Anna Louizos’ simple, two level set moves seamlessly from location to location and takes advantage of the two levels to highlight multiple locations. The set assists Peter DuBois’ direction as the scenes move in an out effortlessly; he has built a strong unit of trust and attention that makes the outrageous circumstances seem plausible and innately human. Sons of the Prophet surprises in its complexity through simplicity. Like Yasmina Reza, Stephen Karam uses realistic characters with outlandish reactions to continually make their world turn over and over. The entire composition creates a work of art that will be praised for many years to come. TNETG. 4/13/11. This entry was posted in Comedy and tagged 2011, Anna Louizos, April, catastrophes, Charles Socarides, Comedy, Dan McCabe, Dee Nelson, grief, Huntington Theatre, Joanna Gleason, Jonathan Louis Dent, Kelsey Kurz, Lebanese, Lebanon PA, Lizabeth Mackay, May, mining town, new play, pain, Peter DuBois, Roundabout Theatre, Sons of the Prophet, Stephen Karam, Yusef Bulos by beccackidwell. Bookmark the permalink.